The home screen is the pinnacle of iPhone personalisation, the thing that separates our individual generic devices from each others. Which few apps do you choose as the most precious? It’s the modern day equivalent of MySpace’s ‘Top Friends’ (look it up, kids). I think the first person I saw regularly sharing shots of their home screen was Shaun Blanc, but this has now become a fairly standard thing to do. For me though, it’s more about why people choose the apps they do and its evolution over time, as demonstrated by this 37signals blog post and indeed more broadly throughout Shaun’s regular series of Sweet Mac Setups. So given that I’m about to make the giant leap from iPhone 4s to iPhone 6s, I thought I’d analyse my current home screen in order to draw future comparisons. No surprises here with the four key built-in iOS apps: Phone, Mail, Safari and Messages. Unsurprisingly, the one that gets used the least is Phone – more often than not I will use Siri to initiate a call, especially if on headphones. Despite the many high-profile email clients that have released over the years, I haven’t seen a reason to switch from Mail, and in its iOS 9 form it looks to continue to develop with many some exciting new features. An app I use once a day, every day. A fantastic free language learning tool, Duolingo makes learning fun and simple with its bite-sized chunks and interactive experience. Using the now common “Don’t Break the Chain” method, Duolingo encourages you to learn for just a small amount every day in order to sustain your momentum towards the larger goal of mastering a new language. It’s genuinely fun and hassle-free education, and although it has a notification system to remind you to learn, just the presence of it on my home screen is a forceful reminder to keep up my practice. Certainly not the best app in Apple’s ecosystem, but given our iPhones are used more as digital cameras than actual telephones these days, one that has become essential. Thankfully with iOS 9, Photos is set to become even more intuitive, grouping Selfies, Instagram posts and other categories into smart folders, but still no photo apps, Apple’s or otherwise, have quite worked out the best way of managing thousands of images without endless scrolling. A side note here: You’ll notice there’s no Camera app on this list. This came from a tip on Twitter: Why waste a valuable slot on your home screen for the camera when you can access it from any screen using the Control Center? Like many paid offerings on the App Store, Fantasical fills in a gap lacking in one of Apple’s own apps, in this case Calendar. I personally purchased it for one killer feature – month view with entries listed below – which was removed from Calendar in iOS 7. Apple did eventually reinstate it, but without any clear labelling of events. My diary never has more than one or two entries per day, so being able to see a colour-co-ordinated month at a time is my preferred option, so I’m glad I made the switch. Of course, Fantastical has many other extra features including natural language entry, built-in reminders and several other customisable options which are lacking in Calendar, which for only £3.99 is very reasonable. Incidentally though, the iPad and Mac versions are considerably more expensive, and haven’t offered enough of an upgrade over the native calendar apps for me to part with my money. As for many people, I use Clock purely for alarms – although I do regularly set timers, but always via Siri. It does everything you would want with aesthetic beauty and a decent UI. Apple at its most simplistic best. I love Wikipedia. Now, while you can’t trust everything you read on there, it’s an absolutely fascinating way of discovering more about interesting topics and can lead to hours of reading, jumping from one page to another. Wikipanion has been around pretty much since Apple first allowed third-party apps on the iPhone, and has always been the simplest and most convenient way of searching and browsing Wikipedia. There is also a ‘Plus’ version which adds queuing articles and offline reading, but I’ve never seen the incentive to upgrade. Out of all of these home screen apps, this will probably be the first to make way for something else as Siri becomes more and more useful. Once a staple of the iPhone, and a former necessary gateway to many deeper options, Contacts now finds itself more and more irrelevant as its functionally is directly built-in to many apps, without you needing to manually look up personal details. When Simplenote first launched in 2008, long before iCloud, it offered one of the few ways to keep sync of all your notes between devices. Then followed a couple of years of slipping behind to a plethora of copycat note apps using the benefit of iCloud, but in 2013 Simplenote’s maker Imperium was acquired by Automatic and a new, beautiful update of the app soon followed. Although the official Notes app is making leaps and bounds in iOS 9 and El Capitan, I still find the unobtrusiveness and simplicity of Simplenote to my preference and its fast, reliable syncing a winner. And best of all, both the Mac and universal iOS apps are completely free. While I use Simplenote for long notes, Realmac’s Clear is a wonderful tasks/list manager, again with almost perfect UI / UX. I use it for several lists including my running daily one of small things I need to get done that I may otherwise forget. It’s become an essential part of my life now, and – in GTD terms – is my main inbox for everything. If it’s in Clear, I know it needs doing. You may be thinking why use Reminders if I use Clear? The answer is simple: My Clear lists are either tasks I would like to complete, or lists of things with no deadlines. Reminders, on the other hand, is used for absolute deadline-specific tasks. Of course, I could combine the two but I like to keep the segregation. If a reminder buzzes on my phone, I know it’s important. One of only two social media apps on my home screen, and the one I use the most. I’d put myself in the camp of people who regularly check Facebook, but very rarely post. It’s the modern equivalent of a soap opera – following the up and downs of people’s lives (some of which you haven’t even seen for years) on a daily basis. A seemingly redundant app, but used in my case with a sensible logic – mBox Mail is a Hotmail client that I’ve had since back in the days before Apple’s iOS Mail app supported Microsoft accounts. I still keep it though, as my Hotmail is my ‘Junk’ account for general mailing lists and website sign-ups that I don’t want clogging up my regular email accounts, and it’s nice to keep the two separated. Another paid replacement for an app that’s freely available, in this case Twitter. Often cited as one of the great iOS apps with beautiful aesthetics and a wonderfully intuitive user-experience, I first switched to Tweetbot after the similarly design-led Tweetie was acquired by Twitter itself. Easily my Twitter client of choice – it’s a pleasure to use and a daily reminder of why the iPhone is such a fantastic portable device. At the bottom of my home screen, just above the dock, sit four folders (Media, News, Games and Utilities), each filled with many apps that I like having quick access to, but aren’t essentially to my daily use. 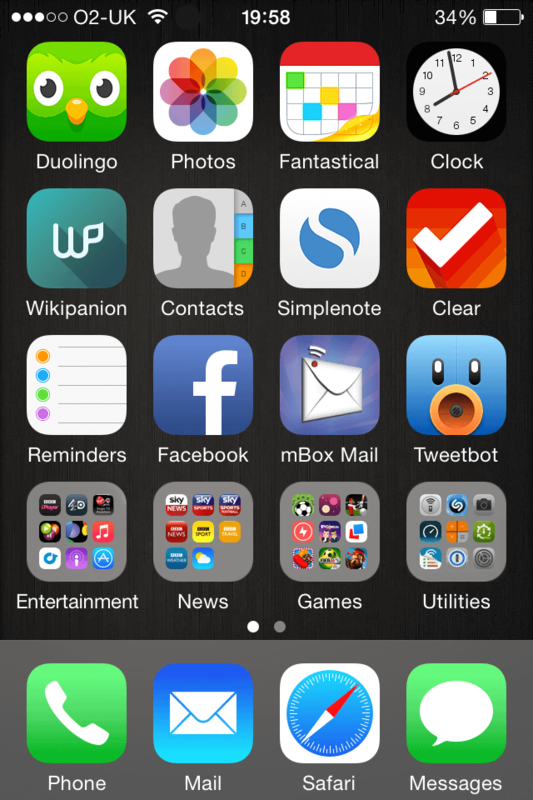 Hopefully with an upgrade to a quicker, smarter iPhone 6s rather than my current iPhone 4s, it will mean searching for apps becomes more responsive and useful, and I will be able to keep the home screen clearer.